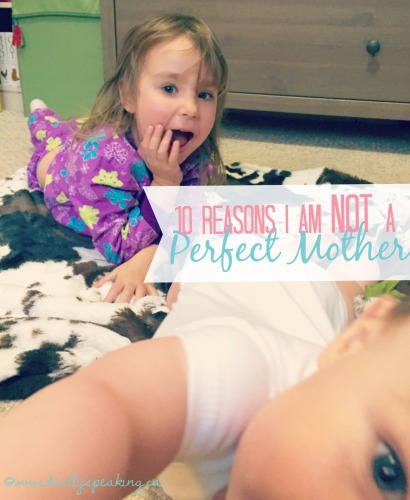 10 reasons I’m not a perfect mother. When I was a little girl, like many little girls, I dreamed of what it would be like to grow up and have a family of my own. I thought about the type of mother I would be. Patient and kind. Loving and playful. I would always try to use a calm voice and my children and I would have the most wonderful relationship all of the time. Parenting is hard work. It’s exhausting and trying. And while it is incredibly rewarding with beautiful moments, I also make a ton of mistakes. So I’m sorry kids. It turns out you don’t have a perfect mother. Every good and honest parenting blogger has shared their shortfalls in an effort to highlight the truth and humour in raising kids. This is simply mine. I’m sorry that I yell so much more than I ever thought I would as a parent. I always try to keep my cool, but everyone has a breaking point. Lilly, you and I can have doozies of battles. When the dust settles, you promise to listen better and I promise to yell less. Some days we keep our promises. Other days we don’t. But I know we’ll always keep trying. Cole, I don’t yell at you because, you know, you’re a baby. But don’t worry son, your time will come. Two – Working mom heartbreak. I’m sorry that I choose to be a working mother. I have 20 grand, and growing, of school costs and a point to prove. Even if just to myself. One day, when you’re old enough to know me as a person and not just your mother, you will understand where my determination comes from and why I have a stronger need to succeed in life. Success comes in many forms and at many levels. For me, part of it is being a mother, but part of it is also having a career. The truth is I really love what I do. I hope one day you were both lucky enough to find something you’re passionate about it and use it for your livelihood. Three – Bedtime. Or lack thereof. Lilly, I’m sorry that sometimes I let you stay up way later than you should. And then you’re super tired in the morning. All because I really secretly want to watch one more My Little Pony episode. On the flip side, I am also sorry that some nights I just can’t help but count down the minutes until you guys go to bed. It is not for one moment that I don’t want to spend time with you. It’s just that sometimes I want to spend time with myself more. Four – The horrible, terrible balloon incident. Five – All the candy lies. Lilly, I’m sorry for all the things that I’ve claimed were medicine. Probably 95% of them were actually candy. I just didn’t want you to have them. I promise that one day, when you’re older, we will have a girls night where we watch movies and pig out on candy till we puke. But not yet. Because your four. And that would be irresponsible. Six – Classic rock lullabys. Seven – It’s my colicky baby & I’ll whine if I want to. I’m sorry Cole, that I whined, to anyone that would listen, about how you were a colicky baby and took up all my free time while on maternity leave. You were and you did. But as a result you spend more time in my arms than I could’ve imagined. And I wouldn’t of changed a second of that. But I did whine a lot. Like I even wrote a whole blog post about it. Eight – Passing the buck poop diaper. Cole, I’m sorry that I slough off most of your poop diapers to your father. I know mothers are supposed to love every inch of their baby and everything to do with their baby. But since we’re being honest here, I don’t love your poop diapers. Your father grew up on a farm and has a much stronger stomach than me. Especially when it’s a cloth diaper. Gross. Nine – Parenting by Netflix. Kids, some days I use TV to parent you much more than I would like. There is only so much pretending to be Anna to your Elsa I can take before it becomes easier to just put on the damn movie and get some laundry done. Or sit and drink a coffee. In another room. Quite and alone. Lilly, it’s kind of alarming awesome that you know how to navigate Netflix on 3 different devices by yourself. Ten – Bribery of all the things. I am so sorry for the bribery. I always said it was something I wouldn’t do as a parent. But truthfully, it is the main weapon in my arsenal. Lilly, I have used bribery to get you to do just about everything from putting on your boots to finishing a meal to leaving me alone while I write/craft/clean. I’m not proud of the low levels I have gone to in order to get you to cooperate in a way that you think benefits you. Like using the disgusting yellow Starbusts that I don’t want. Or convincing you that vitamins are a treat that you should earn…when really we would give them to you anyways if you ever called our bluff. Dear kids, I’m sorry you don’t have a perfect mother. But I am not sorry that I love the hell out of you. I’m not sorry, for even one second, that I decided to become a mother in the first place. At the risk of sounding cheesy, it’s the most rewarding part of my life. Hands-down. There is nothing better than the smiles on each of your faces when you first see me in the morning. Or the way that you each fit perfectly in the space between my head and my shoulder when we snuggle. I secretly love that although you each adore your Daddy, you both prefer me to do your bedtime routine and I am the one you want when there are tears flowing. I will never be the perfect mother. And lord knows I will make more mistakes in the years to come. A lot of them. But I also know that I will do a lot right. Because I am a great mother. I trust my instincts, love with all my heart and I’m not afraid to be silly and play. You are both the biggest parts of my world and always will be. Ideally speaking, you will survive my parenting mishaps and grow up to be perfectly imperfect parents yourselves. I am a working mother. Note to my future self. The mother of a teenage girl. She is a perfect fit. #WordlessWednesday with linky: Lots of Baby! « Capture Family Moments with Life Locket App. Love this post and your honesty!